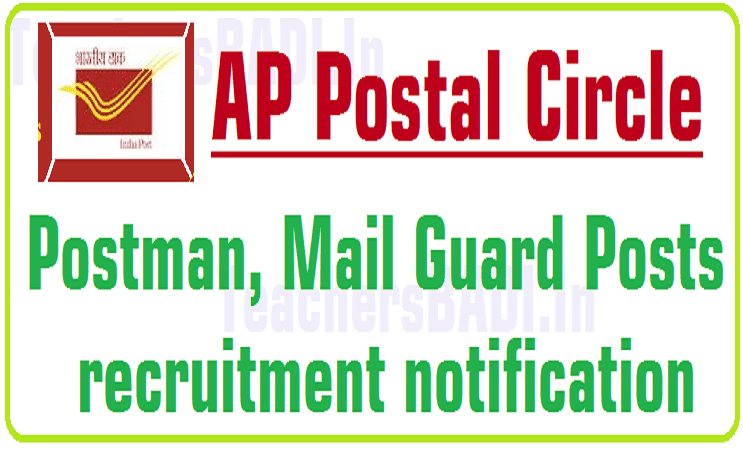 AP Postal Circle Postman, Mail Guard posts recruitment 2019, Last date to apply: AP Postal Circle Postman, Mail Guard Posts 2019 recruitment, AP Postal Circle Online application form, last date for apply for , exam date, hall tickets, results details @ appost.in . Department of Posts, Office of the Chief Postmaster General , A.P. Circle , Hyderabad has issued the recruitment notification on August 4th, 2019 and the Department of Posts invites applications from the eligible and interested Candidates to fill up the posts of #Postman and #MailGuard in the Postal Divisions/ Units in Andhra Pradesh Postal Circle. The Prescribed Fee (application fee and Examination fee ) has to be paid as per the table at 10 above through "Sunayasam" option in any Head Post Office in Andhra Pradesh/Telangana States listed in the Annexure. The Fee is to be credited under "Sunayasam Head:Postman Recruitment 2019." at the Head Post Office with the details Name of the Applicant, Gender, Category, Special Category as per Matriculation/SSC Records & Mobile Number for getting SMS. (a) Before applying online the candidate has to keep all the relevant documents ready for entering the data as per the certificates (like DOB Proof, Certificate of caste, Ex Service man ,PH Certificate etc). (b) The Candidate has to keep ready of soft copies of his/her recent passport size photograph in JPG format(size not to exceed 20 KB). (c) The Candidate has to keep ready a soft copy of his/her signature made on a piece of paper with black ink in JPG format (size not to exceed 10 KB). (d) The Candidate has to update all the mandatory fields and confirm the declaration. (e) The Candidate has to look at preview for verification and correctness of data fed before submitting his/her application. (f) The Candidate has to submit the application by clicking "Save" button. (g) Since preview option is provided before saving the application, no correspondence will be entertained for modifying the application. (h) The Candidate can take the print out of the application and keep for further correspondence. They should not submit printouts of their application. (i) Provision has been made to the candidates to know the status of application submitted through a grievance provision which is available in the website www.appost.in. 2. Last date for primary registration: 28.02.2019. 3. Last date for fee payment at post offices: 05.03.019. 4. Last date for submission of application: 08.03.2019.